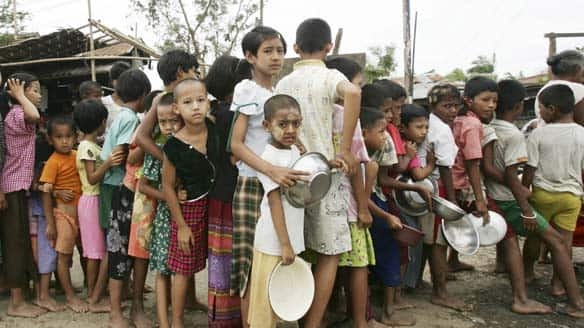 Will New US Policy on Burma be helpful? At present, the ICRC continues to support family visits to detainees and works to enhance the effectiveness of the Myanmar Red Cross Society. The statement suggested Chinese citizens planning to go to the northern part of the former Burma should suspend their trips. Who’s meeting with Burma’s foreign minister? By themselves, sanctions had not produced the results the US wanted, she said after a meeting of foreign ministers from the Friends of Myanmar (Burma) group .. Detained Burmese pro-democracy leader Aung San Suu Kyi says she welcomes US plans to engage with the country’s military rulers, her lawyers say. But lawyer Nyan Win said that Ms Suu Kyi also wanted the US to engage with the political opposition. It comes after the US said sanctions against Burma could be eased if the junta improved its human rights record. Ms Suu Kyi is under house arrest and is currently preparing an appeal against an extension of her sentence. “Daw Aung San Suu Kyi said that direct engagement is good,” said Nyan Win. “She accepts it but she says that engagement must be with both sides,” AFP news agency quoted him as saying. Earlier, US Secretary of State Hillary Clinton said sanctions remained an important part of US policy but that “by themselves they have not produced the results that had been hoped for on behalf of the people of Burma”. She said the US would be looking to employ both sanctions and engagement to “help achieve democratic reform” in Burma. 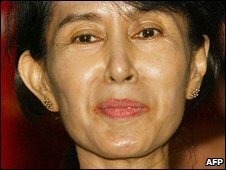 Ms Suu Kyi was sentenced in August to a further 18 months’ house arrest after a US intruder stayed at her home. She has spent 14 of the past 20 years in detention and if her appeal fails, the extension will keep her out of multi-party elections scheduled to be held next year. UNITED NATIONS – SECRETARY of State Hillary Rodham Clinton said on Wednesday that the Obama administration has decided to engage directly with Myanmar’s junta as part of international efforts to promote democracy in the military-run state. Mrs Clinton made the announcement at the United Nations after meeting with her counterparts from a number of countries trying to convince the authoritarian regime to reform, allow dissent and release political prisoners, including Nobel Peace laureate Aung San Suu Kyi. She said that US sanctions against members of Myanmar’s leadership would remain in place but that those measures would now be accompanied by outreach. 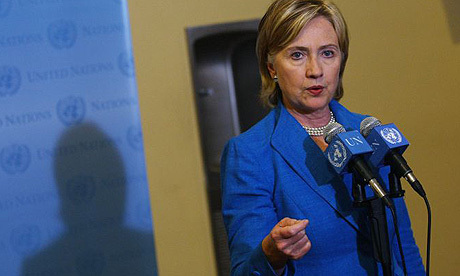 For months, Mrs Clinton had lamented that the sanctions were having little impact. ‘We believe that sanctions remain important as part of our policy, but by themselves they have not produced the results that had been hoped for on behalf of the people of Burma,’ Mrs Clinton told reporters, using the country’s traditional name. The decision to engage Myanmar stemmed from a review of US policy toward the country initiated after President Barack Obama took office. The Bush administration had shunned Myanmar in protest of multiple crackdowns on the opposition. US officials said Congress would be briefed on specifics of the engagement policy on Thursday.